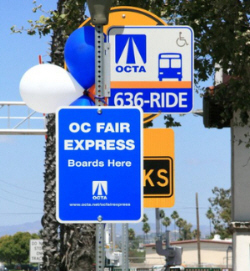 ORANGE – The Orange County Transportation Authority is bringing back the OC Fair Express bus service with locations across the county for just $2 each way, allowing riders to save time and money. The Orange County Fair is on July 11, 2014 through August 10, 2014 and the best way to get there is on the OC Fair Express! The OC Fair Express provides direct bus service to and from the fair from eight convenient locations for just $2.00 each way, or just swipe your valid OCTA bus pass. You can catch the OC Fair Express any Friday, Saturday and Sunday during the fair starting July 11, 2014. All OC Fair Express customers also receive a coupon good for $3 Fair Admission—that’s up to $9 off. So skip traffic and save on parking and admission with the OC Fair Express!